Baritone intonation woes — Chubbuck Guitars :: making & repairing Guitars in a old building just north of Boston, Mass. This week a player brought me in a custom acoustic baritone guitar with a 28" scale length and a LR Baggs Hex saddle pickup system. The guitar is primarily played in drop Bb, but in DADGAD intervals, so Bb - F - Bb - D# - F -Bb. This thing sounds huge and is strung with a custom set of Newtone Strings gauged 0.060", 0.050", 0.038", 0.028", 0.019", 0.016". As with many fingerstyle players, this customer was experimenting with different gauges and drop tunings until arriving at this configuration. The problem is that with these bigger strings, the intonation is pushing everything sharp. What the hell is intonation? Basically in this context, intonation deals with setting the saddle location(s) at the bridge. The correct position will allow the entire guitar's range to play as in tune as possible. Many guitarist know that the tuning system we use does not allow for perfect pitch on each fretted note. Setting the intonation on a guitar is really just minimizing those tuning errors. Since this guitar is playing everything sharp, the points at which the strings break from the saddle need to be pushed back towards the bridge pins. The Hex pickup saddles do not allow you to adjust this compensation, so it has to go. First step is removing the six individual saddles of the Hex. Each saddle has a it's own lead that connects to a circuit board that was attached with Velcro to the inside / back of the guitar. 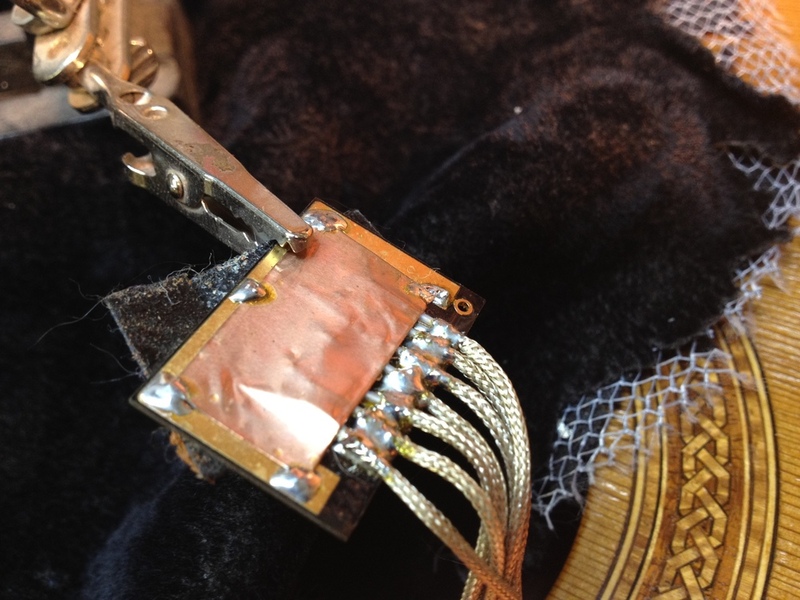 The copper foil is a shield that is tacked down. Desolder two corners and the foil peels back to reveal the six (Hex) saddle leads plus one lead that goes to the output jack. Now desolder the six pickups and the lead to the output jack. Note that this guitar had a dual source pickup system composed of the Hex saddle pickups and D-TAR SoundSpot transducers on the bridge plate. The stereo output jack was wired so that I could disconnect the Hex leads and the D-TAR will still function without any rewiring. The SoundSpots stay, the Hex goes away. 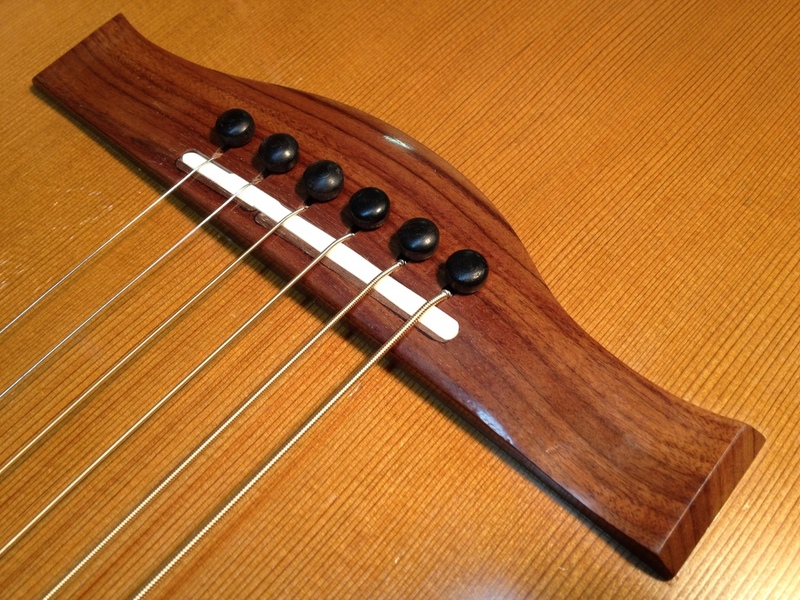 The large gauge strings are going to need quite a bit more compensation than the original split saddle slots would allow. Let's plug these so we can cut a new single slot. And here are those plugs brought down flush and the bridge polished. Yes, I know the plugs do not match as well as I would like. I only had Walnut on hand and this bridge was some sort of exotic Rosewood. Plus the player is a true "player", and not as concerned with aesthetics as he is with playability. Ideally I like to match the plug(s) as perfectly as possible. Ebony bridges are easy to plug invisibly. 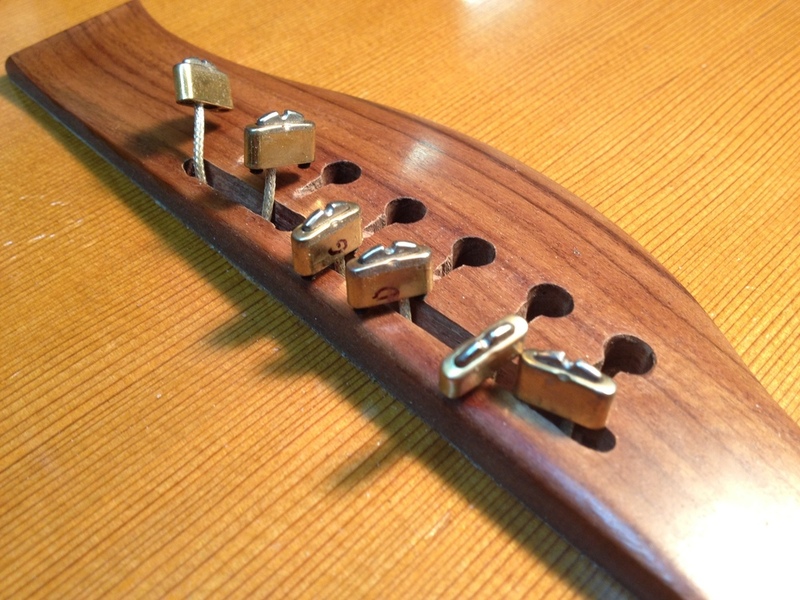 Rosewood bridges are always more difficult. Now we cut a single saddle slot located further back to allow for proper compensation. I am not a fan of split saddles and have yet to come across an intonation issue that has required two independent saddles. Plus it's twice the work for no real benefit, in my opinion. The new saddle is going to be slightly wider at 5/32", which will allow us to better fine tune each string's break point. Here is the front edge location of the new saddle position. 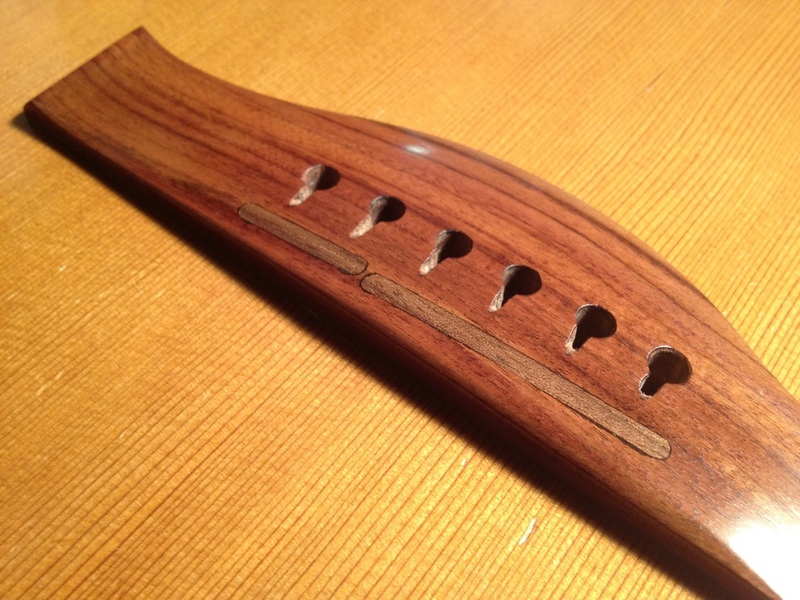 Note that the Hex saddles set the intonation of each string in the middle of the plugged split saddle slots. The pencil line shows the front of the new saddle and will allow me to push the string breaks an additional 5/32" if necessary. That huge 0.060" diameter bass string is going to need to be pushed all the way to the back of the new saddle. My saddle slotting jig works beautifully for cutting slots to accommodate any saddle width regardless of the diameter of the router bit I have. I'm using an 1/8" diameter bit to cut a 5/32" wide slot. First, the jig is clamped to the body. The routing guides are then aligned to cut the new slot in the correct position. I cut the slot in multiple passes until I get down to the depth I like. Then I can reset the rear fence (right side in the photo below) to widen the slot to accommodate the new 5/32" saddle. A feeler gauge spaces the rear fence back roughly 0.030" to give me the approximate 5/32" slot (came out at 0.160"). Once the rear fence is set back, I move the routing guide back until it makes contact with the rear fence, tighten it down and make another pass. And here is the final results with the new 5/32" compensated bone saddle. The original action was quite high, so I brought it down with the new saddle. High action also affects to how well a guitar plays in tune. The higher the action, the more you have to stretch the strings to fret and this can pull notes sharp. The neck angle is on the shallow side, so there is not as much saddle height above the bridge as I would usually like to see. A neck reset would correct for this and give the guitar a little bit more volume. That being said though, I am very pleased with how this repair came out great. The player loves how much better the guitar plays in tune now and also appreciates the lowered action. He commented that can play the guitar for longer sessions at a time now without fatiguing his left hand. So there you have it, the ol' Plug-n-Recut.